In a village of the Po valley where the earth is hard and life miserly, the priest and the communist mayor are always fighting to be the head of the community. If in secret they admired and liked each other, politics still divided them as it is dividing the country. And when the mayor wants his “People’s House”; the priest wants his “Garden City” for the poor. Division exist between the richest and the poorest, the pious and the atheists and even between lovers. But if the people are as hard as the country, they are good in the bottom of their heart. 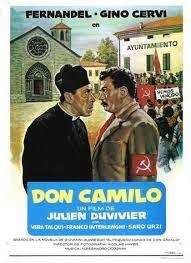 Its success led to producing sequels, creating a saga for Don Camillo’s character.